In late June, Glaukos (an ophthalmic medical technology company focused directly on the treatment of glaucoma) announced that the FDA had approved the much anticipated iStent inject® Trabecular Micro-Bypass System (or the iStent inject, for short) for patients with mild-to-moderate primary open-angle glaucoma. We are delighted to share that our very own Dr. Thomas W. Samuelson performed the first ever commercial iStent inject procedure in the United States here at Minnesota Eye Consultants! We are truly honored to be part of this monumental event and we look forward to the integration of this device into our practice. Glaucoma is a group of vision-threatening eye diseases that can cause damage to the optic nerve, which connects to the brain at the back of the eye. The damage caused by glaucoma is irreversible and unfortunately is one of the leading causes of vision loss. As a sub-specialty practice, our team of eye care providers is devoted to the management of glaucoma and is frequently involved in research studies as we strive to advance the safety and efficacy of the treatment options available to our patients. The first-generation iStent was approved by the FDA in 2012, and Minnesota Eye Consultants is proud to have had Dr. Thomas W. Samuelson perform the first two iStent procedures in the state of Minnesota. Since then, the iStent has been widely used at Minnesota Eye Consultants as an exceptional option for a portion of our mild-to-moderate open-angle glaucoma patients. The iStent and iStent inject fall under a newer category of glaucoma procedures, called MIGS (Micro-Invasive Glaucoma Surgery). For many patients, glaucoma can be safely and effectively managed with medications and laser procedures, but for glaucoma that continues to progress, invasive surgical intervention like tubes and trabeculectomies may be recommended. Although effective, these surgical procedures are more aggressive and are often associated with increased risk. The iStent inject and other MIGS devices fall between these two extremes, presenting surgical options that have increased safety with moderate efficacy. Many patients experience reductions in eye pressure and are able to use fewer medications following an iStent inject procedure, while some are able to discontinue medications entirely. 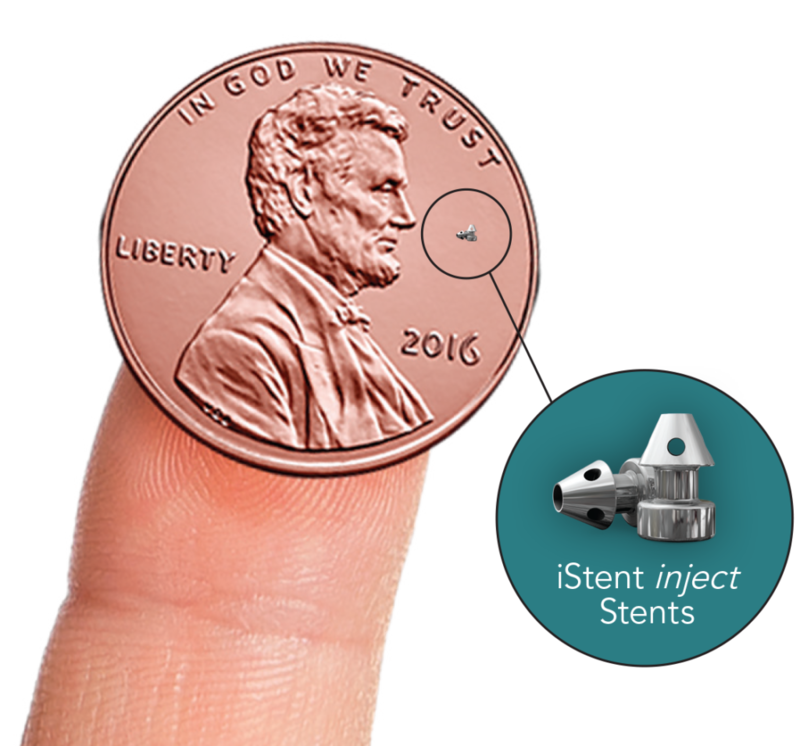 The iStent inject is considered a micro-bypass stent, the smallest known device ever implanted in the human body. Performed at the same time as cataract surgery, this newly approved preloaded system offers precise implantation of the iStent inject into the trabecular meshwork, optimizing the eye’s natural outflow of fluids. For more information on the iStent inject, you can view the official Press Release here.